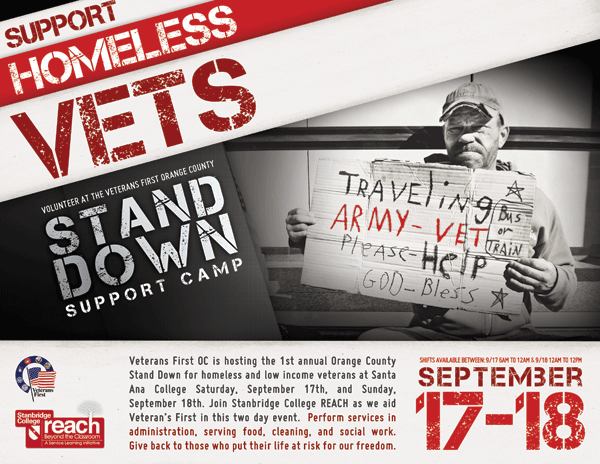 Veteran’s First OC is hosting the 1st annual Orange County Stand Down for homeless and low income veterans at Santa Ana College Saturday September 17th and Sunday September 18th. Join Stanbridge College REACH as we aid Veterans First in this two day event for veterans and their families to access basic services, bond with their fellow veterans and start rebuilding their lives. The Orange County Stand Down will provide a one-stop shop for homeless and at-risk Veterans to get matched with essential services such as medical, dental, and vision exams, employment and housing assistance, as well as Veterans benefit identification and assistance. *When you sign up REACH will send you a Volunteer Registration Form for you to fill out, and fax or email in to Veteran’s First OC.